The Microsoft LifeCam Studio ID Camera (item# Q2F-00013) has been designed to simplify the process of capturing high-quality photo IDs on the spot. Simply connect your LifeCam to your computer and you are ready to capture perfect pictures for all your ID cards and badges. No software is needed and it seamlessly integrates with your ID card software. 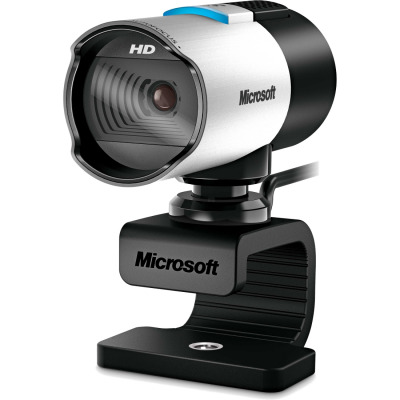 The Microsoft LifeCam Studio ID camera offers HD quality for crisp, high-resolution results. The LifeCam includes autofocus, from four inches to infinity. Shoot with great accuracy in wide angle with the LifeCam precision glass element lens. LifeCam features TrueColor Technology to make your video look bright and colorful in virtually all light conditions. ClearFrame Technology provides smooth and detailed footage. Use the built-in High-Fidelity Microphone to bring it all together: the vivid sights, colors, and sounds of real life. Certified for Skype. Do more together in HD, with Skype certified HD LifeCam from Microsoft. Optimized for Microsoft® Lync®. Designed to work with Lync, Microsoft’s enterprise-ready unified communications platform. Wideband microphone for premium sound recording for natural, detailed audio. 360-degree rotation. Rotates halfway in both directions for an all-around view. Auto focus. From four inches to infinity. Wide-angle lens. Capture more people and surroundings. Optimized for Windows 8. Easy set-up, no driver installation required. 1Advanced functionality not available with all devices and/or operating systems.